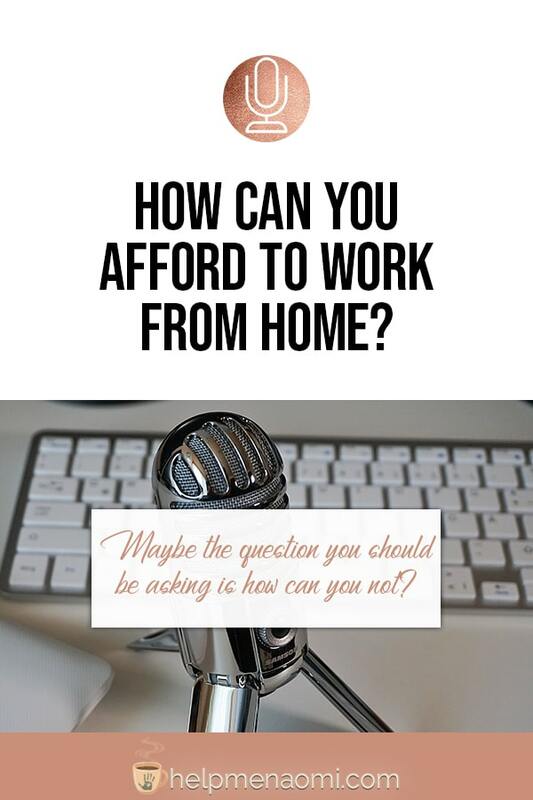 One of the questions I get asked all the time is “How can you afford to work from home?” In this episode, we’re going to break down the considerations to take into account when deciding whether or not working from home is for you. You might just end up asking yourself how can you not afford to work from home? Hi! Welcome to the Geeky Mompreneur, the podcast especially for work at home mothers. I’m Naomi Nakashima, blogger over at helpmenaomi.com and a work at home mama. Today, we’re going to talk a bit about a common fear and misconception: can you afford to work from home? And I get it, I really do. The decision to start working from home can feel large and overwhelming. There’s not just the decision to start working from home and deciding on how to start a new business, but also decisions to be made about housework, hours of operation, and getting your family on board with all the changes that are about to take place. And let’s not forget all the other areas of your life that may change by deciding to work from home. Depending on the type of transition you make, you may find yourself suddenly trying to find health insurance, buy office equipment, purchasing software, setting up websites. All things you never really had to worry about before. And then there are all the new skills you have to learn – and fast. Marketing, lead generation, website maintenance, customer database, copywriting, photography, blogging, social media. And how long will it take before you get your first client? How will you pay the bills until then? There is a lot to think about. And the idea of quitting a day job to start working from home when the income will be unpredictable is scary. So while I say “not being able to afford to work from home” is a misconception, it is still very much a legitmate question and fear. And the reason I say that this is a misconception isn’t because it’s invalid — but rather the decision is usually made based on an emotional reaction to the idea of working from home rather than on all the facts. You see, in this country, we tend to think that if we aren’t working, we’re losing. And we tend to look down on people who work from home. You can tell just about anyone that you’re a self-made entrepreneur who started your own business, but unless you’re at the top of your industry and making millions, no one cares. They think of you as lazy or unemployable rather than being an entrepreneur. On top of that, we have conditioned everyone to believing that you have to work for someone else in order to afford to live. People get fixated on the idea that by quitting their day job to work from home, that they will be losing an income – at least for a time. And that might be true, I don’t want you to think that I am glossing that over. It might be true. But, there are a lot of other things to think about rather than fixating on this. Let me tell you a story. A few years ago, I was working as a therapist and a youngish couple came in looking for help to reconnect. They were fighting constantly, and nearly all the fights revolved around two things: money and the problems their child was having at school (they couldn’t seem to agree on how to handle the issues the child was facing). After the first couple sessions, I asked them to do some homework: write out a complete income and expenses report. Every penny coming in, and every bill going out. That way we could all sit down together and see where the money was going. Do you know what we found? I know you already know what I’m going to say… Now, neither one of them had a stellar job – they weren’t making millions. However, one of them was actually making less money than they were paying out for the job’s expenses: car payment for the second car, insurance on the second car, gas, and childcare. All added up to costing them more money than was being brought in. The expenses that you pay to go to work add up. The commute, the childcare, lunches on the go, wardrobe — it all adds up. So, yes, you may very well be losing an income for a while, anywhere from a few days to even a few months. But you will also be losing many of those expenses. Try it. Take a few minutes, sit down, and add up everything you are paying out of pocket to work for someone else outside of your home right now. And compare that to how much money you’re being paid. You may not be in the same situation in which you’re being paid less than what you’re paying…but you might find that the difference is less than what you thought. Once you’ve figured out how much money you will be saving by staying home to work, your next step is take a look around and see what other ways you can cut down on expenses once the changes take place. For example, at the time I was working as a therapist, my husband worked at a bank. Our little girl was just a few months old at the time, so we would get up early in order to have her at the daycare in time. Then he would drop me off at work on his way to the bank. After work, of course, he would swing by and pick me up and then we would run to pick up the little one. And by the time we had her in the car and were on our way home, neither one of us felt like cooking. And that meant takeout. Far more often than either one of us were proud of. In fact, that was one of the changes we were looking forward to when I left therapy and went back to working from home full time: fewer nights of relying on takeout. Because once again, although it’s convenient and not always all that expensive, it tends to add up. Even just a couple nights a week can still add up to close to $100 a month. Now, I hate to be one of those people who is all “just cut down your expenses and you’ll be fine.” I don’t want to assume that you drink a $7 cup of coffee every day or that you spend $4 on donuts every morning for breakfast. But the truth is we all pay money for something that we don’t really need. Maybe it’s a cable bundle when you don’t really watch television, or maybe it’s a special, top of the line shampoo when really a less expensive one would work. Or, hey, maybe it is that coffee? Then figure out your bills, and try to estimate how those bills might change once you’re working from home. Will you be using the electricity more? Paying for better Internet? Subscribing to software or web services? The point here is to sit down and identify exactly how much money you spend every week or every month, including those little extras, and get it all written down so you can set up a budget. This budget is going to be what makes or breaks you every month. Without it, you’ll be flying blind. Having a budget will let you know just exactly how much it costs to run your home. And you’ll use it moving forward for everything from goal setting to pricing to scaling your business as the time comes. Now, once that budget is set, work with your spouse and discuss how you’re going to cover expenses during the early days of your transition. For some of them, you may want to evaluate whether or not you need that expense or if it is something you can cancel or diminish. For others, you may be able to call and suspend service or defer payment for a short while. One word of warning, if you would indulge me here… Do not forget that you are not working to try to make enough money to continue working. You are not working just to stay in business and pay your bills. Yes, paying your bills is important. And obviously you need to make enough money to keep your electricity on and your antivirus software on your computer updated and your Internet running. But you are also trying to make a living. To get a day to spend with your kids at the zoo, to get that fancy dress, or that new pair of shoes. To buy the bigger house in the nicer neighborhood — or even just to go out to eat every once in a while. This budget will determine just how much work you will need to complete every month to cover the cost of running your home, it won’t determine your salary. So, how can you afford to work from home? The answer is easy: through a lot of planning, analysis, and budgeting. And that brings this episode of The Geeky Mompreneur to a close. I hope you found value in this episode, and if you did I hope you will let me know by heading into iTunes and subscribing, rating, and leaving a review. And of course, you’re invited to come join me over at my blog, helpmenaomi.com. Until next time!! Bye!